Okaz Motors has a wide selection of exceptional pre-owned vehicles to choose from, including this Southern 2006 Chrysler PT Cruiser. This 2006 Chrysler PT Cruiser comes with a CARFAX Buyback Guarantee, which means you can buy with certainty. The Chrysler PT Cruiser GT is a well-built, yet compact and enjoyable ride that is unmatched by any other convertible on the road. With the ability to easily switch between having the top up or down, you'll be able to go about your weekday routine without feeling like you've sacrificed the weekend thrills. The incredibly low mileage and painstaking upkeep on this Chrysler PT Cruiser makes it a once-in-a-lifetime deal that won't last long! Call us today to reserve your test drive! 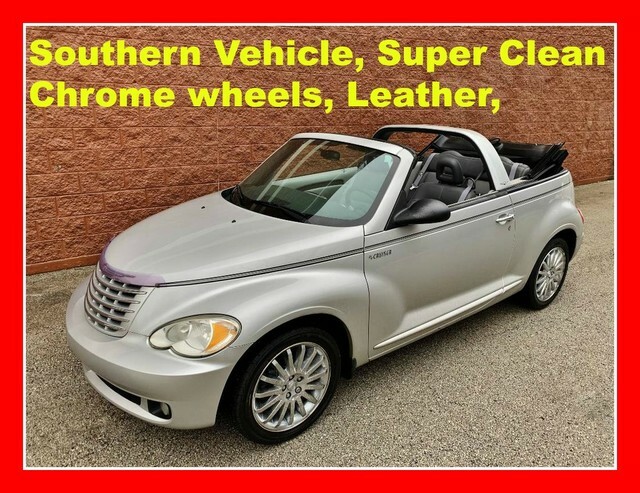 Added comfort with contemporary style is the leather interior to heighten the quality and craftsmanship for the Chrysler PT Cruiser Feel at ease with your purchase of this Chrysler PT Cruiser GT, all records are included allowing you to truly know what you're buying. This Chrysler PT Cruiser GT is in great condition both inside and out. No abnormal wear and tear. You demand the best in everything, so why would your automobile be any different? Enjoy the best features available in this stunning Chrysler PT Cruiser.